Give your students fun and adventure in the safety of a classroom with the Explorer Play Loft. The combination of old world craftsmanship, rock solid materials and extreme safety features is unprecedented in play equipment. 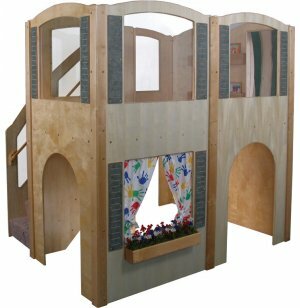 This indoor play area has something for everyone whether they prefer to prepare a pretend meal, play house, host a puppet show, or read. The lower half of the structure features an open puppet theater with a planter window and three arched doorways. The loft can be reached via recessed carpeted steps with a lower handrail that keeps little ones steady and secure. The landing at the top of the play loft includes a mirror and a book-display panel. No need to worry about visibility with so many children playing in one area, indestructible Lexan windows and lower entry ways keep the entire structure in full view for easy supervision. One side is solid, designed to be placed against a wall. 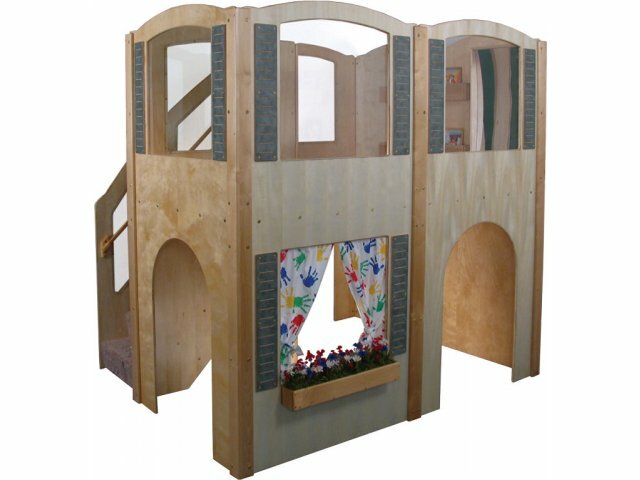 This exciting indoor play area is handcrafted from solid maple and Baltic Birch plywood with three coats of eco-friendly waterborne finish for maximum durability. Cooperative Play: A variety of activities including a puppet theater, book display, mirror and more encourages preschool students to play together. Safety First: Carpeting on the recessed steps and platform provides cushioning and traction while a lower handrail helps children balance as they ascend the steps. Easy Visibility: Indestructible Lexan windows enable caregivers to supervise from a distance without interference. Super Sturdy: Handcrafted from solid maple and Baltic Birch plywood coated with three layers of eco-friendly waterborne finish.